The “Friends of Montefiore Woodland” launch their new website! launch of their brand new website! In April 2011, Thanet District Council formally handed over the area known as “Montefiore Woodland” in Dumpton Park Drive to the people of Ramsgate under the stewardship of Ramsgate Town Council. The Friends of Montefiore Woodland was formed in February 2012. Montefiore Woodland has a fascinating history and character having at one time been the property of Sir Moses Montefiore. It provides a home for many species of wildlife and the enclosed environment has allowed a variety of plants and animals to live and thrive in this peaceful green space. Our next work party is planned for this coming Saturday 27th October at 10am –1pm (weather permitting). We will be clearing ivy, saplings, bramble and litter. Please bring your own gloves and tools if possible and wear appropriate clothing and footwear. In April 2011 Thanet District Council handed over the area known as the Montefiore Woodland in Dumpton Park Drive to the Ramsgate Town Council, to own and to manage it “in the wider public interest”. Largely thanks to the enthusiastic support of two local Councillors, a group of conservation volunteers was formed to look after it, and ‘The Friends of Montefiore Woodland’ held their first Open Meeting in February 2012. The main aim of the Friends is to maintain and improve this natural woodland area – the only one of its kind in urban Ramsgate, and home to parakeets, foxes and hedgehogs – in order to conserve the habitat and wildlife, and encourage its responsible use by members of the local community. They also hope to persuade local residents to take an active role in the group’s activities – in line with the ‘Well Being’ programme of the Montefiore Medical Centre next door – and to promote an awareness of the history of the Woodland. In fact, this particular piece of woodland has a very interesting history. The Victorian Jewish philanthropist Moses Montefiore (Sir Moses Montefiore Bt as he was later to become), purchased East Cliff Lodge (situated in what is now King George VI Park), in 1831, and in gratitude for a safe return from his first visit to the Holy Land he promised that he “…would build a small but handsome synagogue”. He therefore bought a piece of land nearby on which to build this, and it still stands, now a Grade II* Listed Building. The architect was his cousin, David Mocatta, best known as the architect of the stations and viaducts on the London- Brighton line, including Brighton station itself. Although there are much older synagogues, this is probably the first one in this country to be built by a Jewish architect. In 1862 his beloved wife, Lady Judith Montefiore, died, and soon afterwards Sir Moses bought five acres of land next to the synagogue on which to build a memorial theological college to his late wife. The foundation stone of the Judith Lady Montefiore College was laid in 1865, and it was built by the Jewish architectural partnership of Henry Davis and Barrow Emanuel. The college was arranged in a crescent and built in mock-Tudor style with a red brick facade. Sir Moses had intended that the college should house ten elderly scholars, learned in the Law, but it became increasingly difficult – particularly after his death in 1885, at the age of 100 – to find anyone willing to follow the rigorous regime which he had specified. For this reason the college went through many phases over the years, mainly as a training establishment. Apart from boundary walls, it was completely demolished in 1961, and part of of the site became what is now the Woodland. The stone heraldic arms were removed and placed on the wall of the synagogue, near the mausoleum which contains the remains of Sir Moses and Lady Judith. However, the name does live on: the Judith Lady Montefiore College, having moved to London, was reopened in 2005 as a centre for higher Torah education, and occupies buildings attached to the Spanish and Portuguese Jews’ synagogue in Maida Vale. It now trains future rabbis for the Anglo-Jewish community. 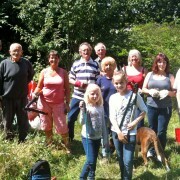 In the Montefiore Woodland the Friends have already organised two well supported clean-up sessions collecting rubbish, a Butterfly Day and a Moth Evening. Members of the local community who regularly visit the Woodland are noticing the difference, and starting to lend a hand. A work session, clearing paths of rapidly encroaching bramble and Field Bindweed, was held on 21 July. 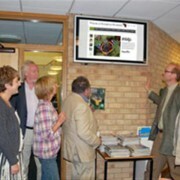 This was combined with a butterfly count in support of the Butterfly Conservation’s ‘Big Butterfly Count 2012’. It was one of the few sunny days in a mainly wet and cool July, so it was ideal for butterfly spotting. This summer has been particularly poor for butterflies, but that afternoon the Friends had their first-ever sighting of a Marbled White in the Woodland. In total nine species were seen: Marbled White, Holly Blue, Small and Large White, Meadow Brown, Gatekeeper, Comma and Speckled Wood; also a Silver Y Moth. The main volunteer working parties will be held from October onwards. Activity has been deliberately kept to a minimum during the summer months in order to reduce the disturbance to wildlife. A major project for the autumn/winter will be the proposed removal of a large expanse of ancient bramble which has now encroached onto the clearing. The aim is to develop this sunny aspect into a wildflower meadow, thus ensuring a valuable habitat for bees, butterflies and other insects. There is no charge for membership of the Friends of Montefiore Woodland, and new volunteers are always welcome: montefiorewoodland@gmail.com or by post to The Secretary, Friends of Montefiore Woodland, c/o The Custom House, Harbour Parade, Ramsgate CT11 8LP.